Making a lockpick can be simple with the right materials and some patience. There are a lot of hobbyists that prefer to fashion their own lock picking tools. 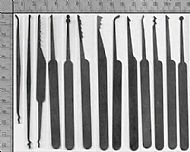 There are also a lot of experienced locksmiths that prefer to make some of their own lock picks. You can make locks picks and tension wrenches by filing and grinding spring steel. Spring steel comes from a variety of sources. You can use the bristles that are left behind from street sweeping machines as well as hacksaw blades, piano wire and shim stock steel, or one of my favourites - butter knifes. There are those that believe that the only good lock picks are the ones that can be fashioned from items found around the house such as paper clips, steak knives, bicycle spokes and safety pins. It's all a matter of personal preference. If you are the kind of person that enjoys a challenge, then go for it. For everyone else though, just spend the few ££££s on a lock pick set. It is not the tools that make the lock picker. You don't need one of the fancy hundred pound sets of lockpicks with all the bells-and-whistles to be a proficient lockpicker. After you get the hang of picking a couple of the more common locks, then you can worry about extracting the spokes off of your brother's bike. Take my advice and learn the basic locksmith skills first. There will be plenty of time later on that you can tear apart your house and salvage material for your very own custom lock picking set. What good are the lock picks if you don't know how to use them, At locksmith training merseyside we make our own lockpicks and lock tools and encourage our trainees to make thier own. You must first know the mechanics of the lock you are trying to pick before you should even worry about making a lockpick. Once you get the feel for picking the lock, you'll be able to use nearly any tool you want. Understanding the lock mechanics are the key to lockpicking, not the tools. Cooperate with the lock and it will cooperate with you. Patience is critical; if you lose patience you will never succeed. Keep motivated and with a little time and patience you will be able to defeat the lock. You'll acquire one of the most needed and appreciated skills a professional locksmith has, patience. Then you'll have all the time in the world to grind down your steak knives and bend piano wire into the proper shapes and practice making lockpicks. If you'd like really detailed instruction about how to make your own lock picks from everyday household items as well as materials that are very easy to source check out Steven Hampton's newest book Improvised Lock Picking. In Improvised Lock Picking, the author (a master locksmith himself) reveals little-known secrets for devising quick and easy lock-picking tools on the spot, using common household items found in the average home, office or garage. Through photos and detailed exploded drawings, you'll see how these improvised tools can be used to open a wide variety of locks found all over the world. 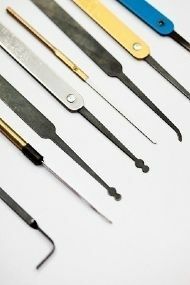 Here at locksmith training merseyside we are really into making your own lockpicks we think it gives you a greater insite into locksmithing and how the lockpick works.